Making Sense of the Jigsaw Puzzle: A Parent’s Account of a Child with Autism by Theuns and Tania Henning is based on the Henning’s experience with their autistic son Reuben. Reuben was their long awaited son who arrived after years of fertility treatments which they had underwent. Initially it was perceived that they may have a child who was inflicted with down syndrome as previously suspected. It came as a total shock when the doctor announced that Ruben has severe autism. It was a lifelong disease which had no cure and there was very little which could be done to alleviate his condition. Theuns and Tania would have to learn by trial and error what worked and what didn’t with Reuben. It wasn’t an easy journey for them and they are still learning now what has to be done for their son to be able to live a “normal” life. They were fortunate to have help from their community and have friends and relatives reach out to them in their time of need. The physical and financial help that was rendered to them was invaluable and helped them tie over all the difficult periods that they went through. It was a refreshing read to hear from a parent’s perspective how dealing with Autism has been like. I have Autistic kids before and it is very challenging trying to get their attention and understand how they tick. It’s remarkable that the authors were able to overcome their own mental and physical barriers to be able to reach out and provide for their son. The amount of patience and love that they have is really amazing. I would have given up long ago if it had taken 18 months of diligently bringing my child to the potty every 5 minutes to toilet train him like what they did for Ruben. It takes a lot of discipline on the part of the parent and being consistent for an Autistic child to be able to learn. Most of the time there is no clear indication that the child is able to understand the given instructions and only in moments of clarity will things suddenly click and the lesson taught product results. Theuns and Tania Henning are really an amazing couple. Do pick up a copy of the book Making Sense of the Jigsaw Puzzle: A Parent’s Account of a Child with Autism to experience the Henning’s story. Disclaimer: I received a copy of this book for review purposes. All opinions are 100% mine. This post has affiliate links. 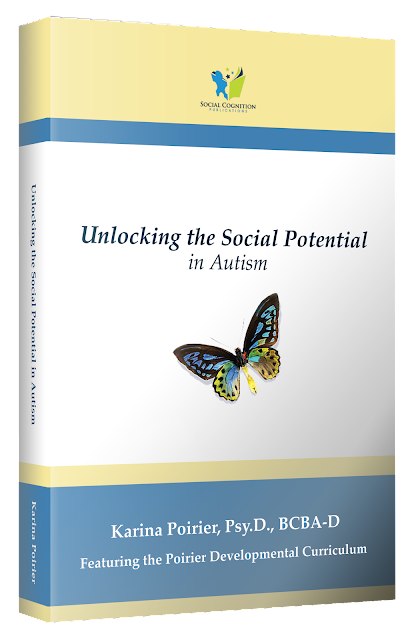 Unlocking the Social Potential in Autism by Karina Poirier features the Poirier Developmental Curriculum which Karina had designed to help kids with Autism. Autism is disorder which is getting very prevalent nowadays. I hear and see many more people suffering from Autism these days as compared to when I was a child. What is Autism and how can it be treated? In Karina’s book she explains that Autism is derives from biological errors in the formation and development of the brain. These errors affect the child’s ability to communicate and socialize with others. It also affects their habit formation. Autistic children have a strong preference for sameness, ritual and repetition. They have problem understanding verbal and non verbal cues by others and as a result difficulties in communicating with others. They need to be taught the proper way to communicate and relate to others. Play is a very important factor in their development. While playing they exercise their narrative skills, develop their divergent thinking and build up essential social skills. The Poirier Developmental Curriculum is an extremely unique way of teaching an Autistic child. There is heavy usage of graphics and specific instructions to get a child to understand what is being taught. Eg: When showing a picture of a doctor Karina would tell the child- “This is a doctor” before asking “Who is this?” and getting the child to response. ” A doctor”. She uses guided responses and inputs knowledge in bits and pieces so that it is easy to understand and digest. There is a lot of reinforced learning at each step so that the child is able to follow what is being taught. Role play is another commonly used tool to get the child familiarized in different social situations. This not only teach them the way to behave but also helps them get use to the way they are suppose to act in the given situation. They are taught step by step what other kids do automatically like associations and creating stories about it. I found the Poirier Developmental Curriculum a really interesting method. There is a lot of re -enforcement at every stage and repetitions of each stage so that the child fully understands what is expected of him. I feel that this method would work well for struggling learners also as they too have a very limited attention span and difficulty in comprehending new information taught. A lot of prompting and hand holding is given and this helps to build up the child’s confidence. The skills taught move from basic to advance so it is tailored to the child’s progression. Porier’s method is great for improving on a child’s EQ and would certainly help a pre-schooler in her social development as it teaches through modelling. I will be trying some of the examples with my 3yr old during the upcoming school holidays. Disclaimer: I received a copy of this book for review purposes. All opinions are 100% my own. This post has a compensation level of 3. Please visit Dominique’s Disclosure page for more information.